Though not billed as a Halloween event, the Art Deco Society of Los Angeles's annual Hollywood Forever Cemetery Walking Tour takes place every October, when falling leaves and autumnal winds evoke memories of scary stories told at night, of Jack O'Lanterns and costume parties, of eager trick-or-treaters flitting through the shadows in a quest for popcorn balls and candy corn. Except, of course, when the brutal Southern California weather offers summer-style sunshine that melts visitors into helpless puddles of perspiration. Global warming aside, the tour is entertaining and informative, though definitely pitched toward history fans; its costumed guides and characters evoke the Art Deco era of the 20th Century, not the ghosts of the dead. 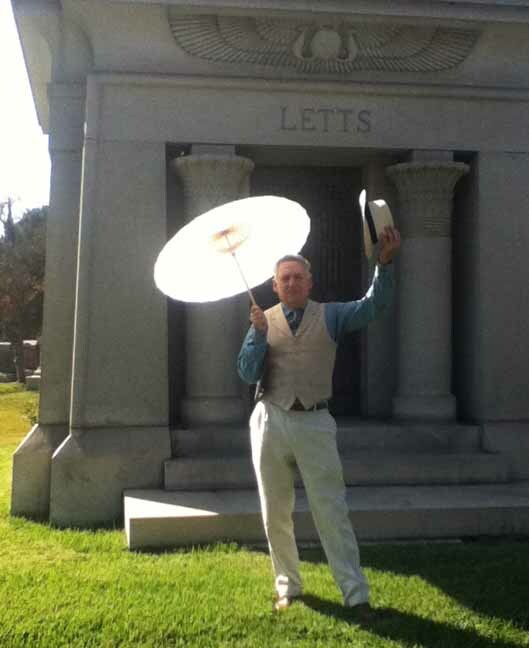 The Hollywood Forever Cemetery tour covers a lot of real estate in two-and-half hours, with over half-a-dozen guides curating different areas and then handing their guests off like human batons. In keeping with the Art Deco Society's name, the focus is on monuments with elements of the Art Deco style, which was popular in the 1920s, 1930s, and 1940s. The first two portions of the tour emphasize aesthetics, with some historical background about the deceased. The presentation can be dry, but the guides enliven the material with jokes, and some of the information is fascinating. For example, we learned is that cemeteries are actually in the real estate business; their owner's job is to sell people plots of land. Cemeteries are not, however, in the monument-maintenance business: once family has erected gravestones/statues/mausoleums for their loved ones, the maintenance of those memorials is the family's business; consequently, when older monuments fall into disrepair, the cemetery takes no action, unless the situation presents a potential danger (such as an obelisk on the point of falling over). Later portions of the tour turn their attention toward Hollywood celebrities and/or juicy scandals. Our favorite guide was Chuck, a white-haired gentleman who evinced an actor's dramatic flair while regaling his listeners with sordid tales of despicable deeds and attempted homcides. Eventually, the tour heads into a mausoleum, where the current "Woman in Black" (historican Karie Bible) relates tales of Rudolph Valentino, and Sherri Snyder embodies silent-screen-star Barbara La Marr. The Art Deco Society seems to have done its research, unearthing little known information and correcting rumors with facts . For example the sad story of Virginia Rappe, a model and actress who lies buried in Hollywood Forever Cemetery, is a well-known celebrity scandal: her death from a ruptured bladder was attributed to a sexual assault by silent-film star Roscoe "Fatty" Arbuckle; the accusation and the resulting trials destroyed his career. However, as the tour guide pointed out, not only was Arbuckle eventually acquitted; his jury actually wrote a letter expressing unequivocal belief in his innocence and stating that the charges against him were so groundless that they should never have been filed. On the other hand, Chuck couldn't help making a morbid play on words regarding Jayne Mansfield's "headstone," alluding to the legend that the blonde bombshell was decapitated in a car accident - even though the official coroner's report attributed her death to head trauma, not decapitation. Another educational note: Mansfield's headstone is a "cenotaph," a memorial marker where no body is buried (Mansfield is actually in Fairview Cemetery). Hattie McDaniel is also represented by a cenotaph. The Oscar-winning actress had wanted to be laid to rest in Hollywood Forever Cemetery, but the cemetery's owner refused, because she was black. 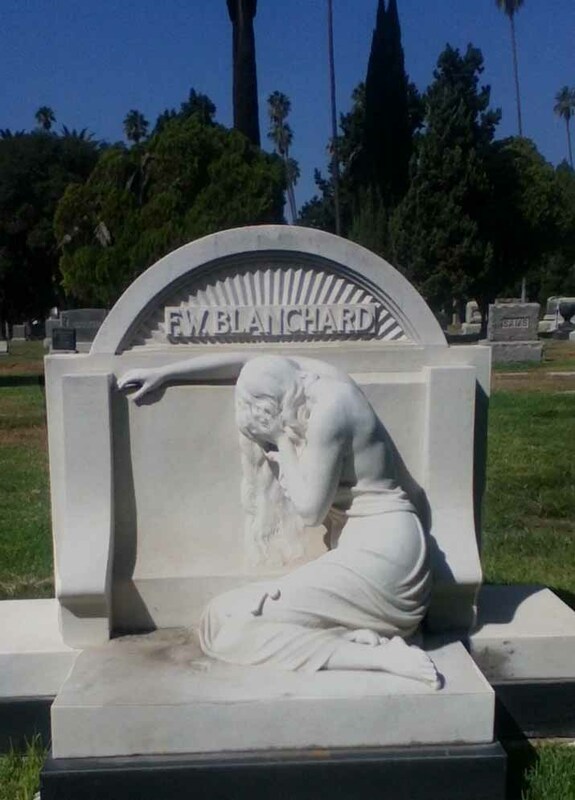 A later owner tried to rectify the insult, but McDaniel's family was not interested in exhuming and moving her body, so a cenotaph was placed in Hollywood Forever Cemetery instead. 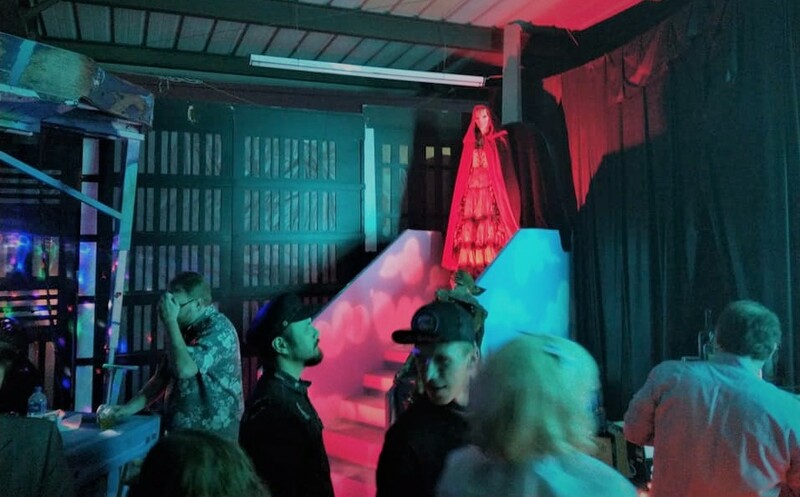 Though the Art Deco Society excursion is sometimes billed as a "Living History Cemetery Tour,* only the last two two vignettes truly take on aspects of "living history," with The Woman in Black and Barbara La Marr brought to life before our eyes. 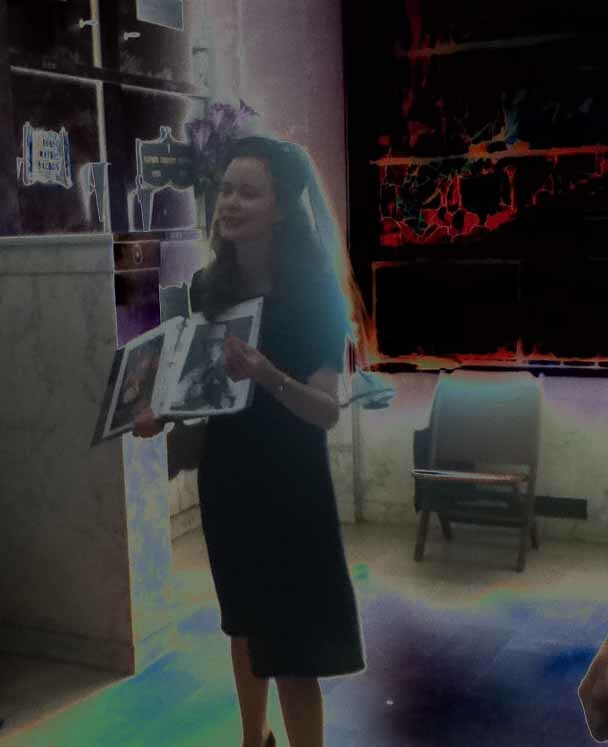 The so-called "Woman in Black" was a mysterious young lady who visited Valentino's grave, leaving red lipstick stains on the marble stone and claiming to have been married to him and/or to have born his children. La Marr was an actress but also a writer whose stories served as the basis for some early films - a rare achievement for a woman in the silent movie era. We enjoyed both segments, but we found ourselves continually diverted by the thought of how miserable it must have been for the women to be wearing black dresses in the suffocating heat of the airless mausoleum. Fans of Art Deco stylings and/or Hollywood history will enjoy this cemetery tour, but remember to check the weather, dress appropriately, and bring bottled water if necessary. Still cameras are allowed, but Hollywood Forever Cemetery does not permit videotaping. Hollywood Forever Cemetery is located at 6000 Santa Monica Boulevard, Hollywood, CA 90038. The Art Deco Society of Los Angeles conducts its tours on a single Saturday in October, with departures every twenty minutes from 10 am to noon. Click here for more information. For those who prefer not to wait until October 2015, Karie Bible conducts her own Cemetery of the Stars tour almost every week. Reviewed on October 11, 2014. The Art Deco Society of Los Angeles describes the event as the "Hollywood Forever Cemetery Walking Tour." Karie Bible's Cemeterytour.com website uses the description: "Living History Cemetery Tour," to distinguish the Art Deco event from other cemetery tours she conducts throughout the year. Though not a Halloween event in the strictest sense, the Hollywood Forever Cemetery Tour is entertaining and informative. 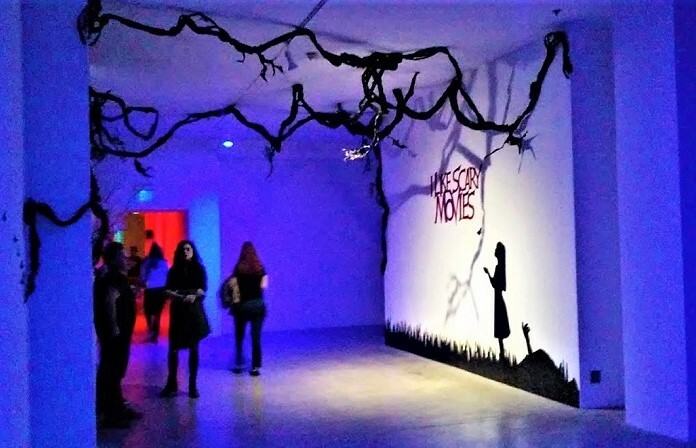 More focused on aesthetics than apparitions, the tour nevertheless delves into some dark corners of Hollywood history, raising a spirit or two in the process.